The Forest Conservation Law aims to save, maintain and plant forested areas for the benefit of county residents and future generations. Trees and forests filter groundwater, slow stormwater runoff, help alleviate flooding and supply wildlife habitat. Trees cleanse the air, offset the heat generated by development and reduce energy needs. And in a less tangible sense, trees improve quality of life in a community by providing recreation and visual appeal. Since 1992, the Planning Department has approved development applications that have permanently protected some 9,000 acres of existing forest and 2,000 acres of newly planted forests. 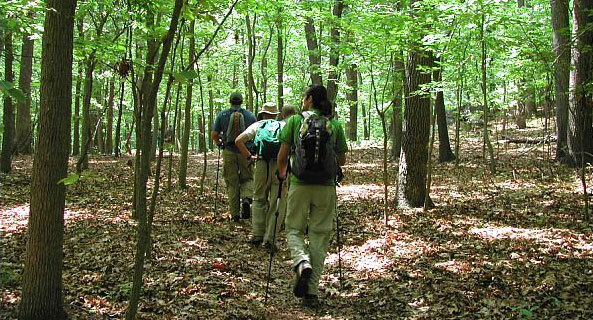 Environmental planners have mapped more than 3,000 forest conservation easements across Montgomery County to inform the public about how to respect easements and protect natural resources. Locate areas under easement. Witness a potential forest conservation violation? Call 301-495-1314. Are you subject to the Forest Conservation Law? Owners of properties greater than 40,000 square feet who are required to submit a development application, or conditional use (special exception) application, or to obtain a sediment control permit must comply with Forest Conservation Law provisions. Depending upon the amount of forest proposed to be removed, the property owner may qualify for an exemption from submitting a forest conservation plan. Check out our flow charts to find out whether our conservation provisions apply to you. Answering these sets of questions will help you determine your next steps related to conserving our forests. View our decision tree (PDF) for applicants of development plans, mandatory referrals, conditional uses, and/or sediment control permits or view our single-lot decision tree (PDF). Anyone with property greater than 40,000 square feet in Montgomery County must complete a natural resources inventory, a complete picture of the natural resources to identify streams, slopes, critical habitat and other features. We also ask for a detailed summary of existing forest and its characteristics. Results of your application will determine whether you need to file a forest conservation plan. View our tips on planting and caring for trees. Changes to the Forest Conservation Law became effective on October 17, 2018. Changes to the Forest Conservation Regulation: The Montgomery County Planning Board approved changes to the regulation on November 1, 2018. The proposed changes must first be approved by the Montgomery County Council before they take effect. Changes to the Trees Technical Manual: Planning Staff is currently working on revisions to the Trees Technical Manual and anticipates presenting their changes to the Montgomery County Planning Board in the spring 2019. Since 2008, the Planning Department has initiated major reforestation projects in Montgomery County stream valley parks to improve water quality and habitat. 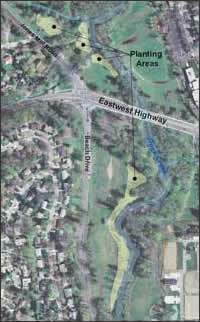 Large-scale planting programs take place on selected natural areas, such as Reddy Branch and Rock Creek and Watts Branch, funded by fees from developers unable to meet forest requirements on their site. Volunteers are always needed to help maintain young forests. M-NCPPC staff reforested four areas along Rock Creek near Jones Mill Road, Beach Drive and East-West Highway. Leaves for Neighborhoods is a program to increase the county’s tree canopy on residential property. Partner with us by planting shade trees in your yard. To increase urban tree canopy, our Shades of Green program provides free trees to property owners in 21 central business and road code districts. Request a tree from Tree Montgomery, a program run by the Montgomery County Department of Environmental Protection to plant shade trees for free. The State of Maryland also offers a $25 coupon toward a tree purchase. Together with Leaves for Neighborhoods, individuals can get up to $65 off the price of a tree. Download and view forest conservation forms and templates.